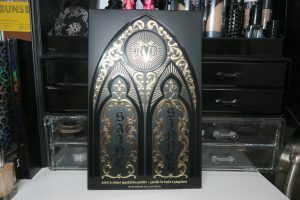 So here it is…the long awaited holiday collection palette offering from Kat Von D Beauty…introducing the Saint + Sinner Palette…ahhhh! You’ve probably seen it already on social media/ YouTube and if you haven’t…where have you been?! Ha ha, but seriously…look at it! I know I say a lot of palettes are pretty and in fairness they are, this however is another level of beauty altogether! It’s looked amazing seeing sneaky peaks of it online for all this time, but in the flesh it’s something else! Inspired by the stained glass windows of Old World Gothic cathedrals and divided in to 2 contrasting sides that mirror Kat’s own duality (and all of us!) hence ‘Saint + Sinner’. The Saint side embracing Kat’s softer romantic side with wearable effortless hues to the contrast of the Sinner side, offering unexpected and daring bold pops of colour to empower and create drama! 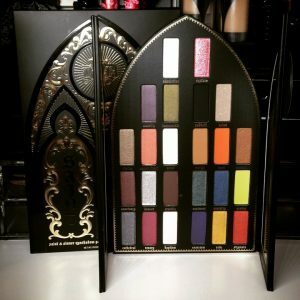 Open the outer (regular KVD cardboard packaging, but still gorgeous all the same) packaging and the palette itself is such a striking…LOVE the design! I usually store palettes piled high or away in drawers, but this one will definitely be out for me to swoon at on a daily! 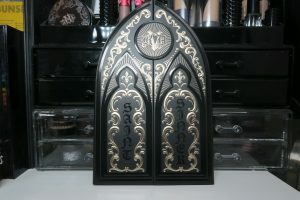 Black reinforced cardboard, similar to the OG Shade + Light Contour palette (UK* / IE*) …on the front there’s the KVD signature logo in the centre as well as beautiful filigree gold embossed design, mimicking a big gothic cathedral door. On the back, similar to the outer packaging (and a feature that I really like in an eyeshadow palette) it has all the shadow shade names also in gold lettering. It opens up to reveal the 2 Saint/ Sinner sides, Saint to the left and Sinner to the right. There’s 24 (all new shades) of pigment packed eyeshadows in total, 12 on each side with 4 finishes…punchy metallics, shimmering pearls, velvety smooth mattes and also 2 of the new glimmer special effect shades, designed to transform other shades almost like a topper and give the most beautiful prismatic multi dimensional pearl effect that’ll catch the light at any opportunity! (they’re the 2 very top shades in the palette). * fun fact…shades with the same name as a KVD everlasting lipstick shade are the same shade in eyeshadow form. Since it arrived last week, I’ve been absolutely obsessed with the Saint + Sinner palette! The shades, the names, the packaging…everything!! I’ve been over in Dublin for the week or so I’ve had it and way busier than expected, so obviously I’ve swatched all the shades and have worn quite a few of the more neutral tones over the last week, but I seriously can’t wait to have a proper play and create some looks with the stronger pops of colour! (Let me know by the way in the comments if there’s any particular look or specific combo of colours you want to see or are loving yourself!) 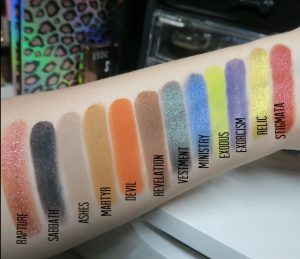 The shades are super creamy, blendable and intensely pigmented (standard with KVD shadows across the board!) with no fall out at all from the shades I’ve been using so far. The glimmer shades I find apply better and give a more intense finish using your finger and patting the colour on, even over a glitter glue or tacky primer…I like the NYX one*. 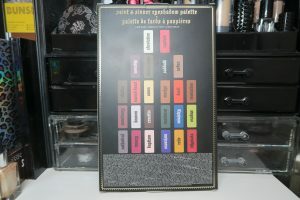 If you missed out on any of the previous KVD holiday palettes, (especially Mi Vida Loca!) you’re not going to want to miss this one! At the time of me writing this, it’s still available on Sephora* and although currently sold out on the KVD Beauty* website there is an email alert you can sign up to. The Kat Von D Beauty website now ship internationally too, also to Ireland if you’re reading from over there, which is great stuff as Sephora don’t currently ship to you guys directly and you’d normally need to use a mailbox service. The brand website does also have exclusive launches too, so handy for that! The Saint + Sinner Eyeshadow Palette will be available from Debenhams (UK* / IE*) from 10th October too. Remember this is limited edition lads, so get on it or you may* (*see you definitely will!) live to regret it! Keep an eye out/ follow me on Instagram to see more and to see the looks I create with it. 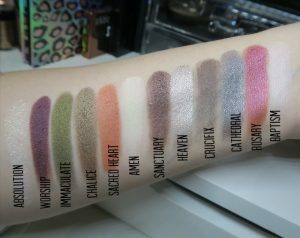 Will you be picking the Saint + Sinner Eyeshadow Palette up? ?